Nuria’s quiet life with her husband, a travelling salesman who she doesn’t see as often as she’d like, is given a jolt when she reads an enigmatic advertisement in the newspaper that stirs her dream of becoming a writer. Even though she’s not quite sure what’s going to be involved, she agrees to become an anonymous writer of answers to questions sent to a radio show for which Elena Francis plays the role of agony aunt. Her work seems simple: she has to answer the letters that the show doesn’t have time for. But everything changes when a desperate listener tells her about children born with terrible defects. Nuria decides to investigate further and uncovers a criminal international network that will put her life at risk and change her fate forever. After the success of Volver a Canfranc, Rosario Raro returns with a gripping novel that will captivate her readers. A very successful agony aunt. Letters that conceal a dark plot. And a brave woman ready to do whatever it takes. 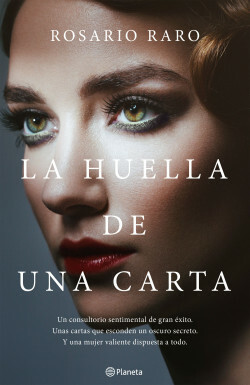 After the success of her first novel, Volver a Canfranc (Return to Canfranc), which was one of the great literary surprises of 2015, with over 50,000 copies sold and audiovisual rights purchased by the successful producer Diagonal TV, Rosario Raro comes back with a powerful novel that also throws light on real life events that have been intentionally consigned to obscurity. The most popular radio show in Spain, the thalidomide scandal, when the drug was given to pregnant women in the sixties, and a story of forbidden love between a married woman and a former priest are just some of the unsettling aspects of this addictive thriller.